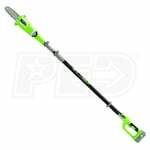 Choose an electric pole saw to quickly and easily trim trees without having to climb much. We’ve compiled three separate lists sorted by top-rated, best-selling, and expert recommendations for each electric pole saw type. If you want more information before shopping, visit our Pole Saw Buyer’s Guide. 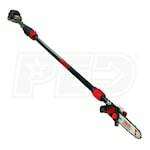 Best Electric Pole Saws.. Our Power Equipment Direct how-to library can help you learn about Tips for Starting Your Gas or Electric Chainsaw, Benefits of Corded and Cordless Chainsaws and Proposition 65 Product Labeling.